I haven't posted a really good deal-i-o lately, but for you chocolate lovers, I have one for you! 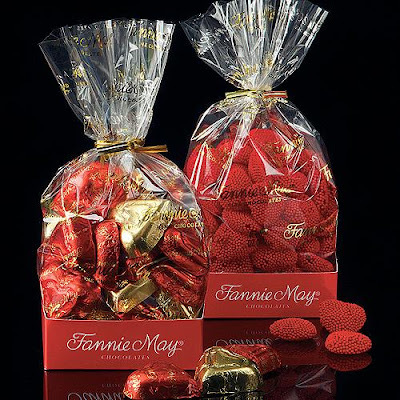 Even though Christmas and Valentine's Day have come and gone, that means GREAT DEALS on candy from Fannie Mae! STEP TWO: Choose what you want. The sale items can be found through the "specials" link (and there is currently also a banner that links to them). The cheapest item is $3.50 (4 oz of chocolates in a heart). I think the 8 oz foil hearts would be a great choice! ($4.50). STEP THREE: Checkout and use the code 10565 to get free shipping on any amount! I do not know how long this code will last. STEP FOUR: Ebates will automatically credit your account with another 7% of your purchase! After the rebate and coupon the lowest cost item (4 oz chocolates in a heart) is only $3.25 shipped! I ordered the foil hearts for my Mom. The gummies were all sold out, so if you want the hearts, you'd better hurry!!! My Grand Total with tax was $4.78. SWEET!!!! What is Ebates? And if you have a link or something, I'll join under you. With online rebates from Ebates, it is so easy to save some cash! You can get discount coupons, cash back, and online coupons; for instance, with this deal, if you clicked on the Ebates link above (this link is my referral link), you'd receive $5.00 in your account for being a new member, plus you'd also get 7 percent cash back in your account from your Fannie Mae purchase. I get way to much chocolate for the Kids at school. I'm still working on the candy from Christmas not to mention Valentine candy! I have never heard of Fannie Mae Till my sister in-law who is from Chicago brought some back from a visit. Yummy!